Brass Bands from Norfolk & Suffolk recently proved that banding is very much alive and kicking in East Anglia, with 8 bands from this area travelling to Stevenage last weekend to compete in the Regional Qualifiers of the National Brass Band Championships of Great Britain, and a very successful outing it was too for many of them. Bands are graded nationally into five Sections; Championship, First, Second, Third and Fourth, and Norfolk and Suffolk were represented in all of these apart from Championship, with 84 bands competing at Stevenage. Each Section has to perform a specified test piece, with a draw allocating playing order on contest day, and the performances are judged by 2 adjudicators who are hidden away in a fabric tent in the centre of the contest hall. All contesting players also have to be officially registered with the band they are competing with. 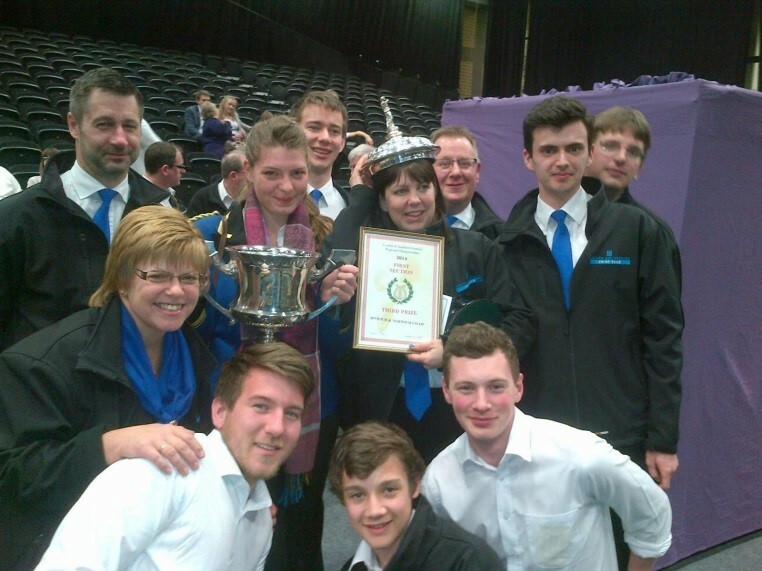 The number of bands competing in each section then determines how many bands go on to the National Finals. The Band probably celebrating the most is Norfolk Wherry Brass (MD Andy Craze), who came 2nd in Third Section playing ‘Partita for Brass’ and qualified for the Third Section Finals in Cheltenham on 21 September, with local ‘rivals’ Great Yarmouth Brass (MD Colin Swaep, only recently promoted to the Third Section, being extremely happy to come 7th out of 16 bands. Ipswich & Norwich Co-op (MD Ian Johnson) just missed out on a trip to the First Section Finals, coming 3rd after a superb performance of the very difficult ‘Cry of the Mountain’, with Haverhill Silver (MD Mark Ager) coming 5th and Cawston Band (MD David Stowell) also gaining a very creditable 13thplacing. Soham Comrades (MD Jayne Murrill), who rehearse in Suffolk and competed in the Second Section with ‘Chaucer’s Tunes’ are also celebrating after coming 3rd. After several weeks of intensive test piece rehearsals the bandsmen and women from all these bands will be very relieved to return to normal rehearsals getting music ready for their summer engagements, whilst Norfolk Wherry also now have to wait to see which test piece they have to prepare for the finals. Although there is a rivalry between the Bands when it comes to contest day, players regularly dep for each other at engagements and the bands are very proud that they show true banding spirit and co-operation and support each other. The East Anglian Brass Band Association may have recently cancelled this year’s Spring Contest, but banding is certainly not in a decline in Norfolk & Suffolk.